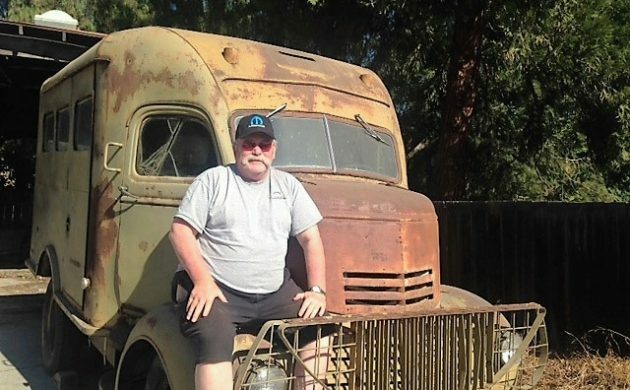 If you desire a rare and unique “Cab Over Engine” truck, then look no farther as this war time ’41 GMC Radio Truck is about as rare as you can get in the COE world. Having last run in the 1980’s, this GMC has spent the past few decades tucked away in storage. 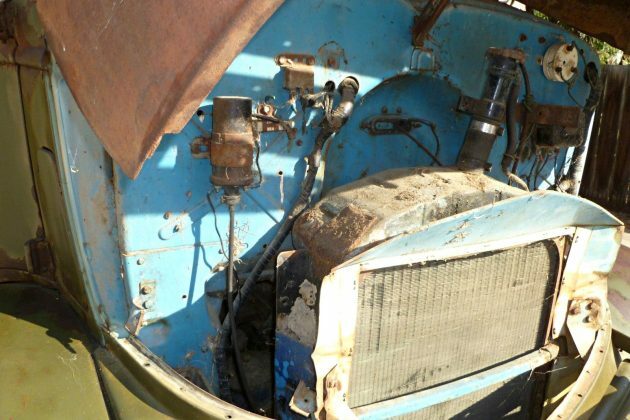 With a clear title, and a potentially colorful past, this COE is bid up to $3,000, or the buy it now price of $9,000 is available. Take a look at it here on ebay out of Santa Clara, California. Thanks to Matt Williams for this awesome submission! Under the hood is a large radiator, and some baby blue paint. The 6 cylinder is tucked beneath the cab, and has spent nearly 30 years or more at rest. 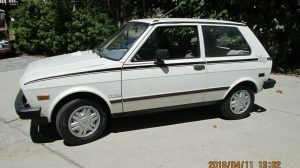 The seller has not tested the engine in anyway, and explains that the previous owner may or may not have oiled the cylinders before putting it in storage. While this truck does roll and steer, the brake system is likely dead, and there are a couple of missing wheels off of the rear dually axle. Despite the missing wheels on the rear axle, there are a few spares included with the sale. There is another wheel inside of the truck, as well as an old bicycle tire, a truly worthwhile bonus. The floors almost seem muddy, but perhaps that is some sort of an adhesive, or sealant? The interior structure of this truck appears solid although there are a few areas where light can be seen though the body work. The dash and interior panels are the same baby blue as the engine bay, which must have been the factory color of this truck before it was converted for military use. 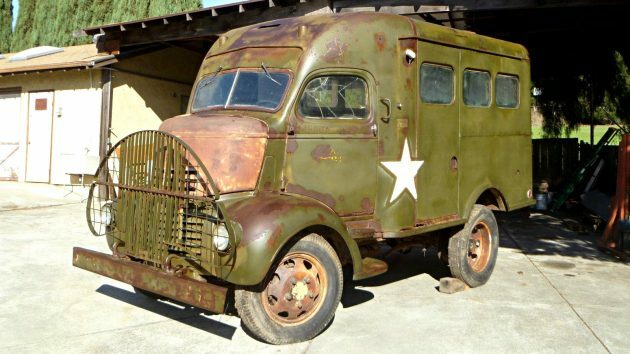 With a charming patina, and a rugged military appearance, it would be very easy to want to clean and preserve this truck as is. 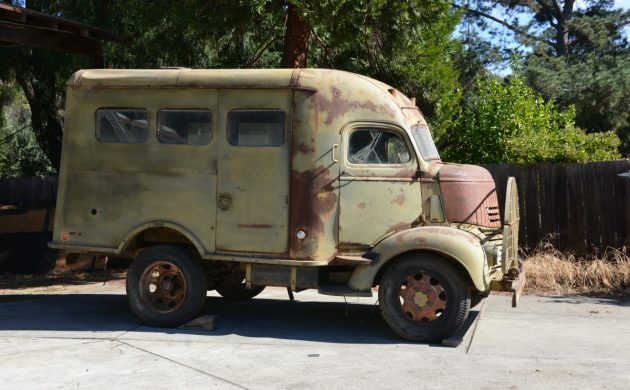 Certainly fitting for a museum, the seller actually intended to convert this GMC into a camper. 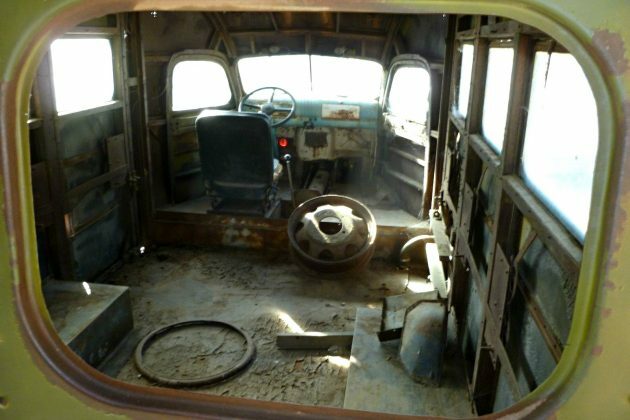 Originally packed with a war time radio unit in the back, that equipment is long gone, offering a large amount of space for whatever you may think of. Despite its charming appearance, there is some rot to contend with. The lower edge of the body work suffers with rot, as does the bottom of the driver door. The body work appears rather straight, and the faded out stars painted on this truck are rather neat to look at. I would say the only other negative aspect to point out about this truck is the cracked glass. Granted this GMC uses flat panel glass, but still an issue that needs to be tended to. 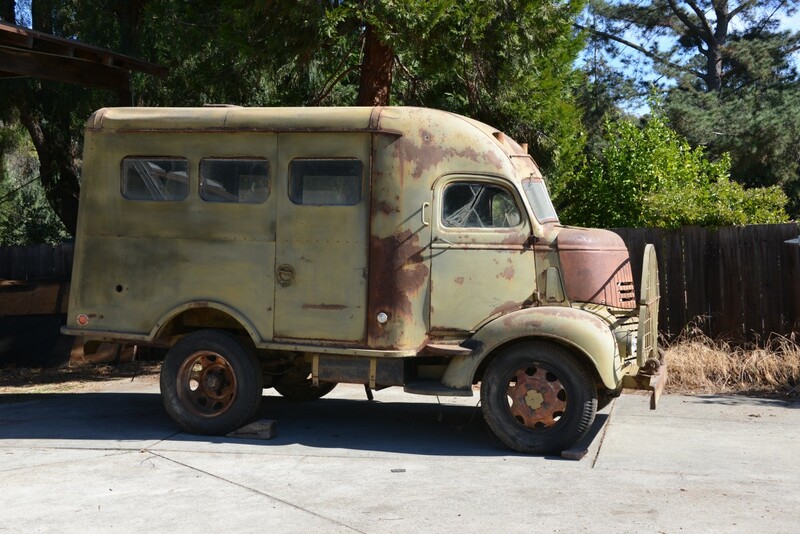 With a fascinating history, and charming looks, what would you do with this GMC? What a cool old relic. Seems like it oughta be about 6 feet longer – definitely has a tippy, top-heavy look about it. Glad it escaped becoming a camper so far… I love custom RV conversions, but this deserves better. Go Navy….maybe ? And why it might have survived….no fowl to our Navy guys (my dad shipped out Navy in WWII ). Talk about a odd ball find. I see this and wonder how it’s lasted so long. Too much for this old man to get into. Get it running and take it to WWII re-enactments. The blue under the hood is odd. I could make a great utility camper out of this. Well what we have here is the Transmitter truck, the receiver was in a trailer that was pulled behind it. The light blue could have been the paint it left the factory with, because some time, when the Government order them, they did not know which branch they would have been going to, Army always used Olive drab, the Navy 90% of the time used Gray, because they had a large amount of that color available, all the ships were painted gray!!!! I have seen one of these some years back a Local VFW post that had invited a group of WW II buffs to come and show the vehicles off for folks. The owner of the radio truck had restored it including the trailer, and had actual WW II radio equipment inside it. Attached is a picture of what one would have looked like. Also this was most likely built before Pearl harbor was attacked. So this was a pre war vintage. That grill guard can double as a head board for your bed. Would you look at the “Roo bar” on that one! Put a cooler of beer in the back. Your wife will shot you over this? Tell her to get her own radio truck. No sweat, Joe — I hear the first guys who drove this got shot at, too. This thing is sooo cool,with any and all possibilities available! it would be gawked at by all within eye sight! Newer drive train would be nice,but not original….oh what to do? I guess just clean it up,make it run,and clearcoat the rest..? 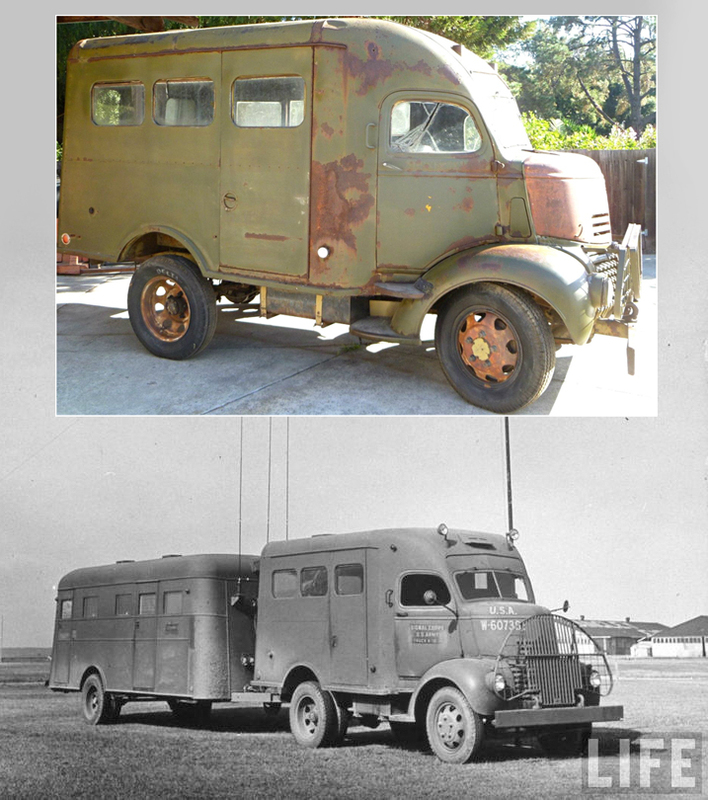 Packrat, Big Mike and Jeepster shared some great info – here’s another photo showing a virtually identical GMC CF351. The K-19 trailer itself looks very much like a typical travel trailer of the period. 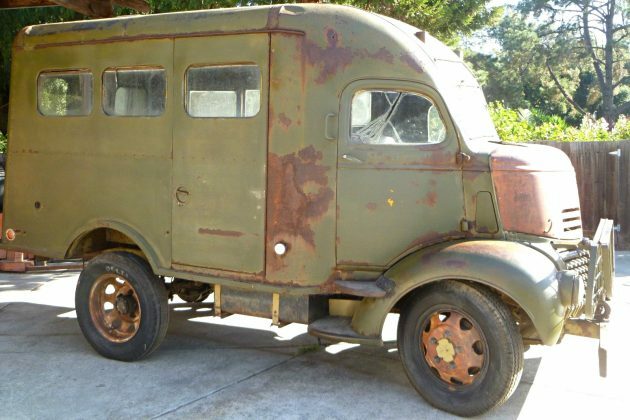 Most late 1930s / early 40s Vagabonds, Prairie Schooner, M-Systems, Gliders or similar would’ve been constructed similarly: wood ribs, painted masonite walls and canvas roof… on a steel ladder frame. *THIS* is what you’d want, in order to complete the project being sold on eBay. 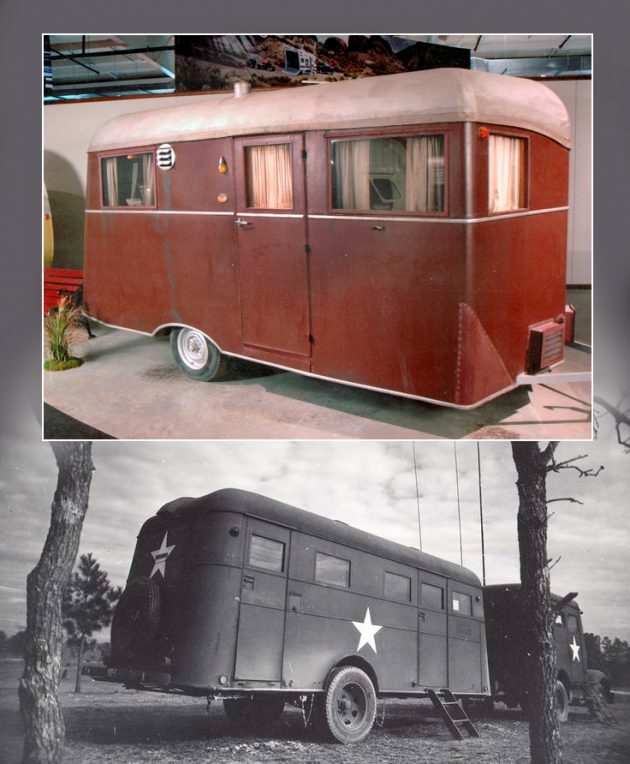 Restore it to original Military use then find a trailer to complete the look, you could sleep in the trailer at weekend car shows. I love it. Sure looks a lot more stable with the dual rear wheels. Interesting truck, I just don’t know what I’d do with it. Mobile beer tap truck for a brewery! Great for selling stuff at the swap meet. Wouldn’t have to unload when you get home, leave her stuffed for the next trip!! Parts would be easy to source for everything GMC, and I see there is a whole website devoted to the Jeepers Creepers trucks. Super! Evidently that fella specializes in 41-48 COE. Everything aft of the cab…why not let your imagination run wild! Haul motorcycles and use as a camper . I’m amazed when lookin @ these ol rigs…that folks used stuff that rough. We sure got it easy. I get the same idea when I C the clothing. My gawd, ever see the winter wear folks usta use? I wuz shocked seein Hillary’s stuff he took up Mt Everest! I am the person in Seattle that sold this truck to the gentleman in Santa Clara. He had tracked me down through other websites, he had been searching for one of these for years. I bought the truck when I was 17 years old as it was a running barn find just 2 miles from our house in the central valley area of atwater winton area. 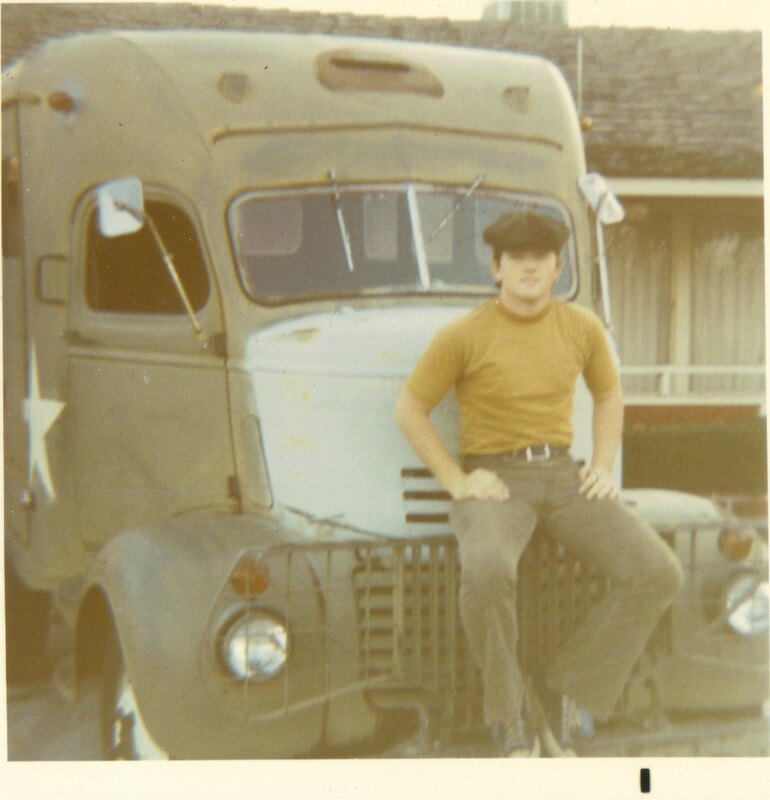 I bought it for $350.00 and drove it high school, I graduated in 71, and that was the last time the truck ran, I parked it in our pasture and drained the water out of the block, and squirted oil in all of the cylinders, the engine isn’t stuck. The engine is a very healthy GMC 270 inline 6 cylinder OHV engine. I took out the 4 speed rock crusher and installed a Clarke 5 speed transmission with 30% overdrive, that allowed the rig to reach a screaming 55 MPH, back then the original small Honda cars feared the bumper of this rig. Long story short, the truck was going to be hauled off for scrap because of the passing of my stepdad, and the property was going to be sold, the gentleman in Santa Clara contacted me in time to save this truck, I sold it to him for the sum of $600.00, and I did it for a reason, I wanted the truck to go to a person that really wanted it, and at that price, I knew he could not refuse, besides, I sold it for more than I paid for it, good karma indeed! I was shocked to find out a couple of days ago that the truck was put up for sale, I was assured that the truck was going to be invested in heavily and put back on the road, but lets be clear here, it will take a bucket full of money to make it into the rig it should or could be, the original drive train is ancient and not desirable at all, trust me on this, as I own several vintage rigs, and at 65, I am still having fun putting money into cool rigs from the past, but no more trucks of this size for me, been there endured that, and my father owned a wrecking yard when I was growing up, so I had plenty of inspiration and influence from very cool machines in our wrecking yard in the 60’s and 70’s. All that being said, who knows what situation arose that prompted the man I sold the truck to, to put it up for auction, it is what it is. I was really looking forward to being able to keep in touch with him and drive it again after he got it running with a new drive train. I even went to santa clara months after he got it home, and I was able to get some pictures of me sitting on the fender as a proof of a reunion with an old cool great unique friend, but all that is history now. 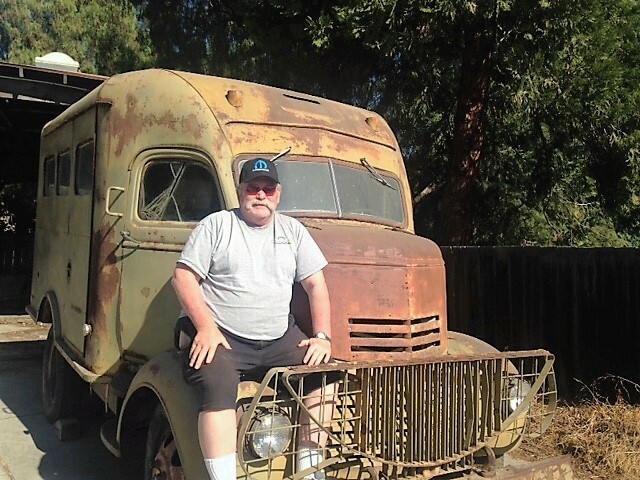 This is me when I went to Santa Clara to see the truck at the new owners place, amazing how time fly’s by. Hello from Dennis in Seattle, the original owner of this rig. I see no one has stepped up to the plate to inform me of where this truck wound up at? The gentleman I sold it to in Santa Clara has not returned any of my texts or e mails or phone calls. Be that as it may, that inst the issue. I am shocked that anybody would bid this up to $3000.00 or even consider paying the buy it now price of $9000.00. Granted its a very cool rig, but as a person that has invested in other rigs, the price to upgrade this truck with modern gear to make it truly road worthy, suffice it to say, it would easily eat up 50 K to do it justice, truck parts and labor and paint and tires and wheels, etc, etc, etc, its not for the timid in terms of letting money go to be cool. This rig has all ancient running gear in it, and to even think of trying to put it all back to original military specifications, I will be glad to give you a hammer to start banging your head with it. This truck requires a ton of love and care and patience and money and skill to make it correct and fun to drive, all that being said, who ever bought it, they better be ready to dish out some bucks to do this rig justice. I would love to know who actually purchased it, I don’t care about the price they paid for it, I just want to know where the truck wound up, its a piece of my past I would like to keep track of.